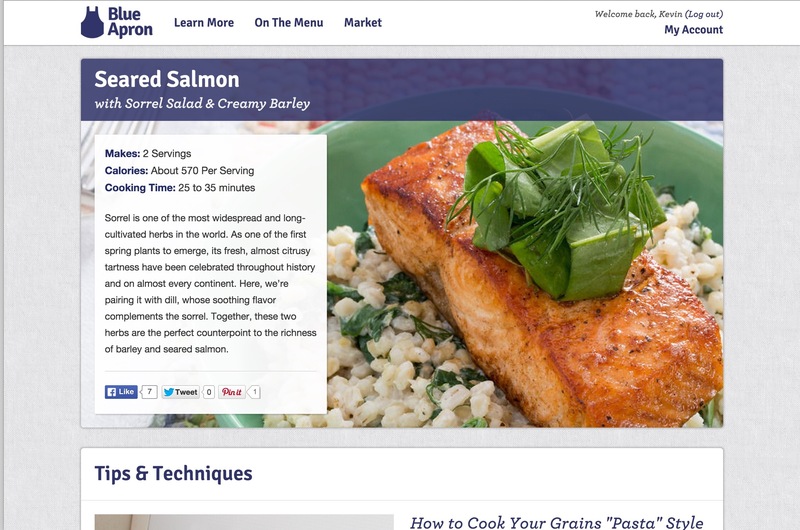 Blue Apron ships you weekly, insulated boxes full of raw ingredients for a few different meals. You can choose how many and what types of dishes you want (veggie, beef, fish, poultry, etc) as well as your preferred delivery days. The website is easy enough to use and of course features very attractive food photography. Having done Plated, the ordering experience seemed very similar. A notable difference is that the meals are $10 each (tax and tip included), which comes in just below the standard $12. I think that’s achievable for a pair like Julie and myself, though it still seems like a steep cost for, say, a family of four. 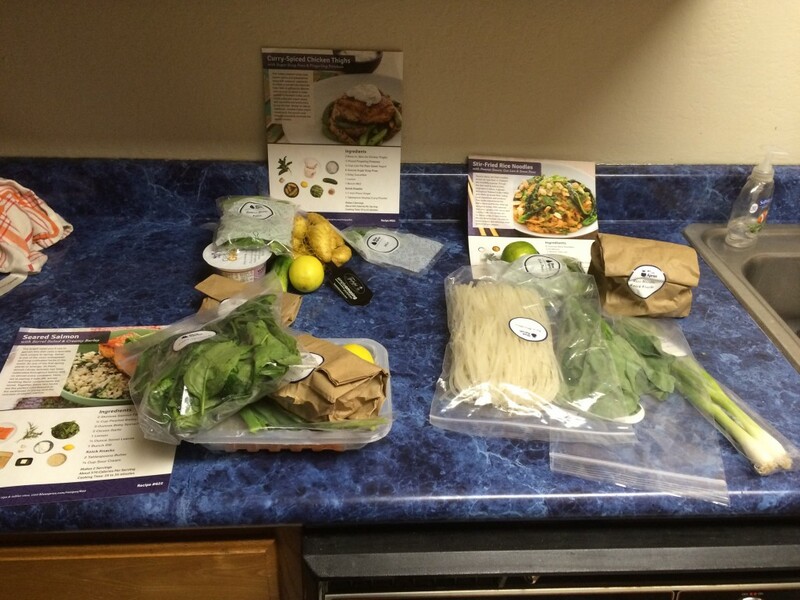 Unlike Plated, there were multiple options for days of the week to get the delivery. Due to the holiday, we were unable to get our first choice, and we even were somewhat concerned about our second choice (Wednesday) since we were coming home late. When we got home at 10PM, however, the box was still present and cool. Since most of the items came loose, we got 3 separate bags to stay organized in our fridge. Typically, Julie will wash veggies and do any stove work while I chop veggies and get sauces prepped. I’m not sure if it’s intentional, but we generally found it easy to split the work between us. The barley for the salmon ended up being difficult primarily because I had never cooked barley before. The instructions weren’t too specific, so I figured I would cook it more like rice by not boiling too aggressively and keeping the lid on. I think a more pasta-like approach with more lidless boiling would have worked better (for astute readers, you may notice as I have while writing that the website screenshot above has tips on cooking grains). That threw off the timing from Julie cooking the salmon, but we did manage to get everything on the table at an appropriate enough temperature. We didn’t have too many problems following the instructions. Like Plated, we were told to season with salt and pepper throughout. I think the final result indicated that we did a better job with this, though I’m not really sure how. The estimated prep times were also fairly accurate, and they also seemed quick enough. We were well-organized enough that the grains ended up being the main constraint in all cases, and it didn’t seem to be too much of a burden to get through. From the very first bite, we both agreed that the salmon was a winner. Unlike the salmon from Munchery, we cooked it to the proper doneness for our liking, and we overall found the recipe more flavorful than our Plated meals. 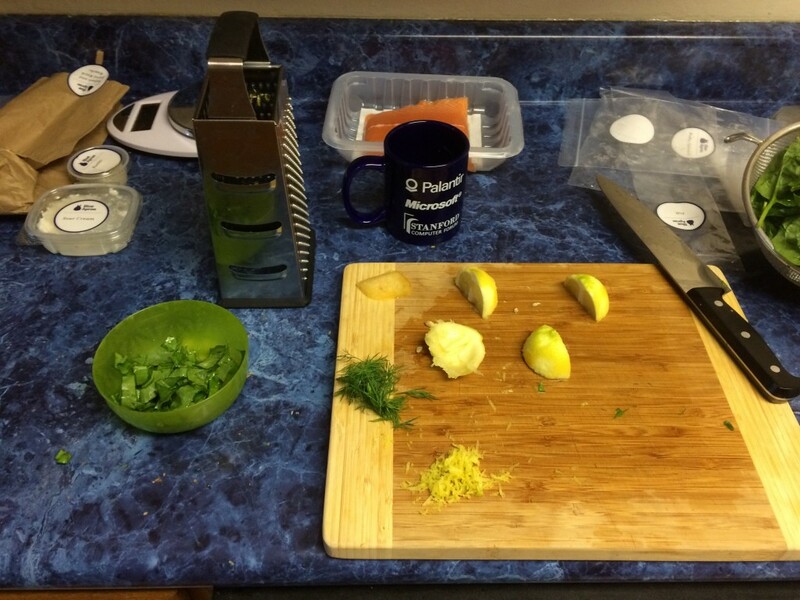 Compared to other meals, we found Blue Apron to be more work to cleanup. 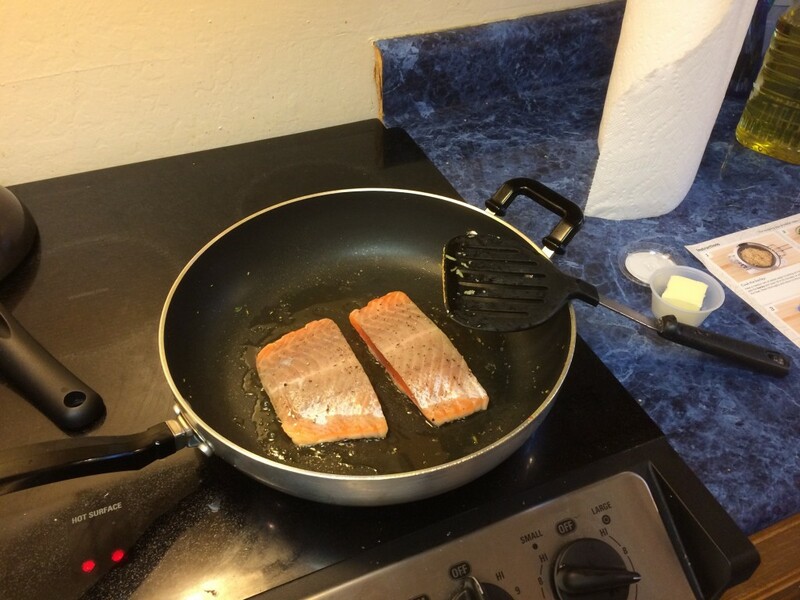 With the salmon dish, we had a very oily pan where we had cooked the salmon in butter, and the pot with the barley had sour cream in it. The noodle dish left us with a peanut buttery pan and serving dish, and the chicken had a curry-ful pan and plates. I’m not sure whether cleanup time is worth optimizing for, but it was certainly far more work than, say, Munchery. 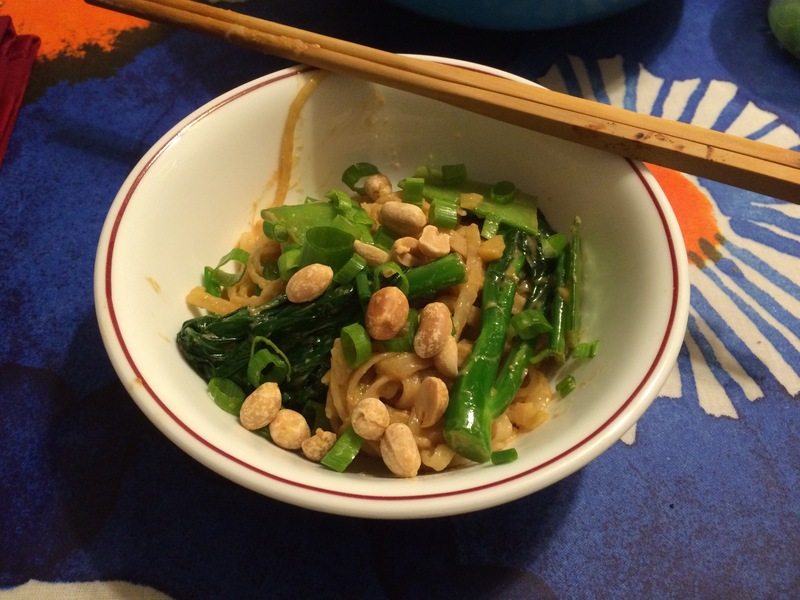 Of the three dishes, we thought that the noodles were the most disappointing: although it looked nice, the flavor was somewhat bland. The sauce tasted most just like peanut butter without enough savory or spicy flavors, and there wasn’t much balance between the ingredients. I did, however, enjoy the curry chicken much better. Other than a slight error on our part of undercooking the inside of the chicken, it was very tasty, and the meal went together well. I have to admit that I usually like yogurt sauces just enough to use them to cut the heat, but I actually really liked the yogurt sauce from this recipe. Overall, we were very happy with the meals, so much so that we seriously discussed doing some of them again. 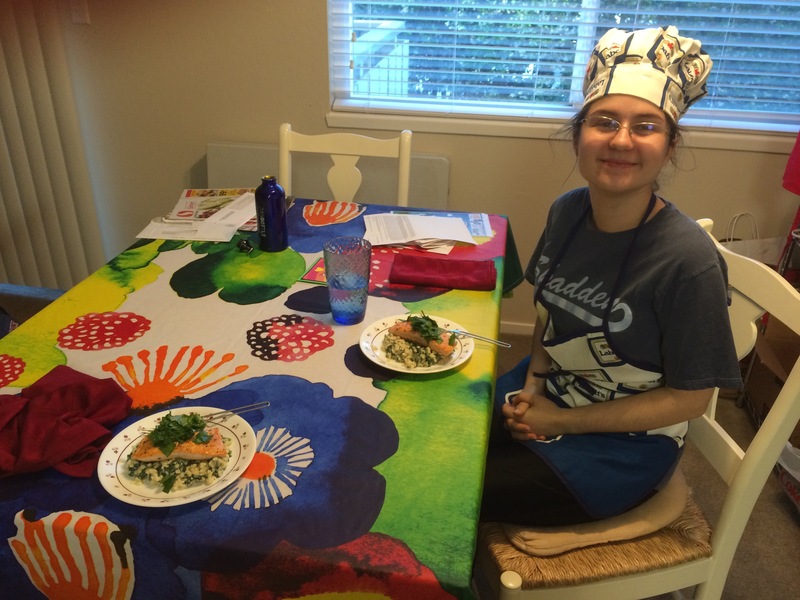 For better or worse, the recipes were less exotic than others we have seen: perhaps it is something that we might have tried or done without Blue Apron, but it also means that we can easily try to do them again in the future. In terms of the experience of delivered ingredients and recipes, I think there’s a tradeoff between novelty and accessibility. 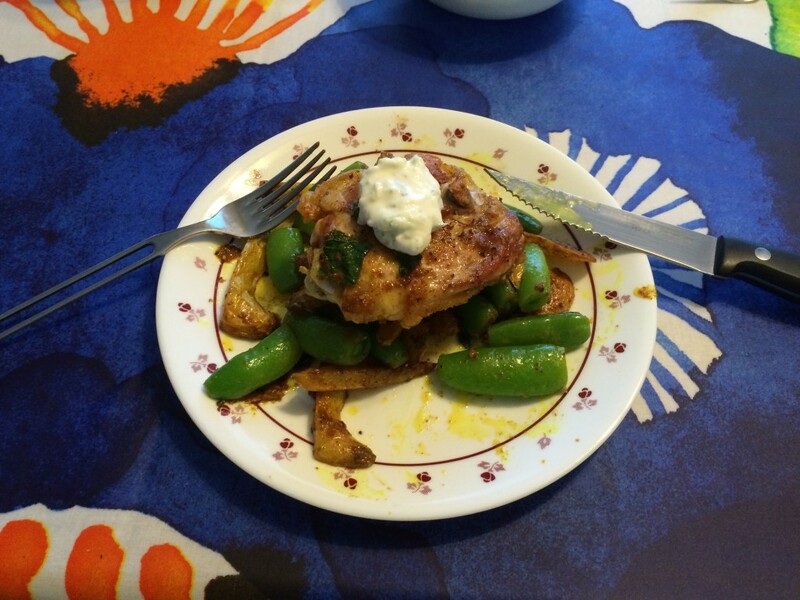 Blue Apron leaned more accessible than Plated, and I think that worked for us. I’m not too sure when the next entry will be coming up, but keep an eye out for it. We’re looking forward to trying more dinner options soon.